One of my first experiences with modern quilt education was somehow coming across a series of free YouTube videos called Quilty, which is a division of Fons & Porter. The beginner tutorials are easy to follow – aimed at an audience that literally knows nothing about quilting. I had no idea really, who the host was, but her name was Mary and she has this magnetic, enthusiastic energy that just draws your attention. I must have spent hours watching tips on cutting fabric, finding the grain, and learning basic quilting techniques. She released the gorgeous book Make + Love Quilts, served as editor of Quilty magazine (which sadly, closed up shop), and also blogs regularly on her website –MaryFons.com. Something you should know about Mary – she defies every generalization you could possibly have about a quilter. While her family name is as synonymous to quilting as the Kennedys are to politics, she holds a B.A. in Theater Arts, and didn’t begin to quilt until a few years ago when she became very ill. Mary is nowhere near a member of the AARP. She is a playwright, a poet, and keeps up the PaperGirl blog religiously – writing about anything from her hospital stay in Atlanta, rat problems in Washington, D.C., to hideously bad airplane experiences. While in New York a couple years ago, I randomly saw her post on Facebook about having a meet-and-greet event at The Yarn Company, which wasn’t too far from where I was staying. It was happening the next day and I knew I had to be there. Well – I went and she is one of the loveliest, most genuine people you could ever encounter. 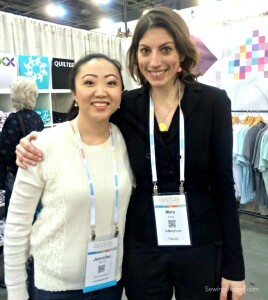 She excitedly talked about quilt history, showed off her beautiful quilts, and for me – I felt like I met a rock star. The one and only Mary Fons! Since then, I have become better acquainted with Mary. She gladly lent her voice to my Quiltonomics article, I took a churn dash block class she taught at the Original Sewing & Quilt Expo, and ran into her in the expo hall at QuiltCon. When I emailed her recently to ask if we could do an on camera interview, she didn’t even hesitate in saying yes. Through my previous jobs, I’ve worked with quite a few celebrities and politicians. Some of them are very down to earth and great to encounter, others are… well, not. In “real life” Mary is every bit the same person on-air as off. Coincidentally, Mary ended up in Atlanta a few weeks later. That’s where I caught up with her – at this year’s Original Sewing & Quilt Expo. Here is the culmination of our meeting… Not gonna lie, we had a blast! If you enjoy watching Sewing Report videos, please be sure to subscribe to our YouTube channel so we can bring you more content in the future – we need your support!